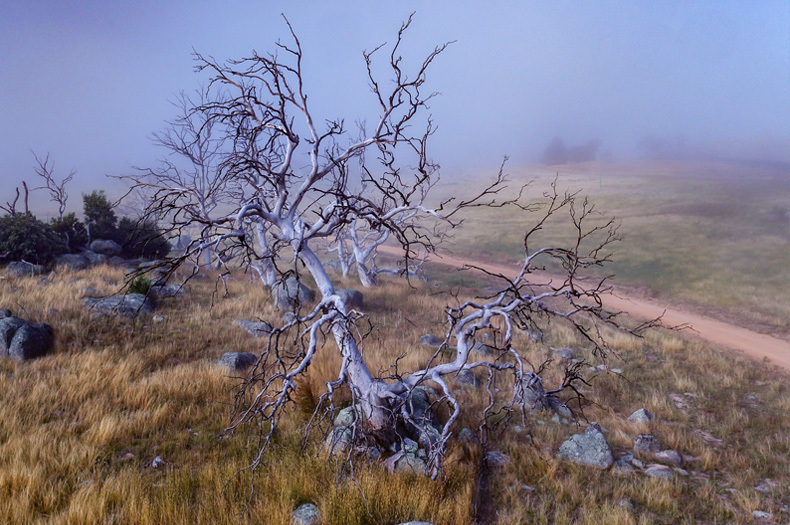 Large swathes of dead and dying Ribbon Gums scar the landscape between Cooma and Berridale. Photo copyright ZRS Photography. Driving through the stretch of the Monaro between Cooma and Berridale in south-east NSW, one cannot help but notice the tall, pale, ghostly remains of decaying trees scattered across the landscape. 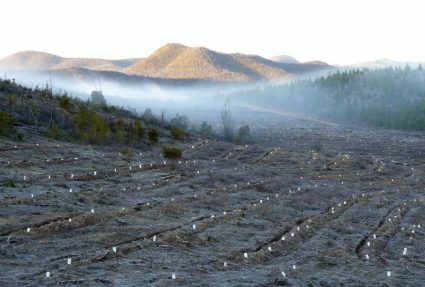 Since the 1990s, native Ribbon Gums that once dominated the Monaro landscape, have been systematically declining in health across a stretch of land the size of the ACT, and many now stand like skeletons in huge tree graveyards. In an effort to curb the path of destruction, Greening Australia is partnering with CSIRO, the Upper Snowy Landcare Network, South East Local Land Services, local landholders and Indigenous groups on the ‘Monaro Tree Comeback Program’, a long-term research and restoration program. The exact cause of the Monaro dieback is still a mystery, but scientists fear that climate change may be to blame. The prolonged periods of drought and increasing temperatures the Monaro is experiencing are thought to be the potential cause for the outbreak of Eucalyptus Weevil – a tiny beetle which invades stressed gums in vast numbers and feasts on the leaves. The loss of the trees has had a devastating effect on local landholders, the landscape and wildlife. Several species of threatened woodland birds are particularly at risk including the Diamond Firetail, Scarlet Robin, Hooded Robin and Brown Treecreeper. 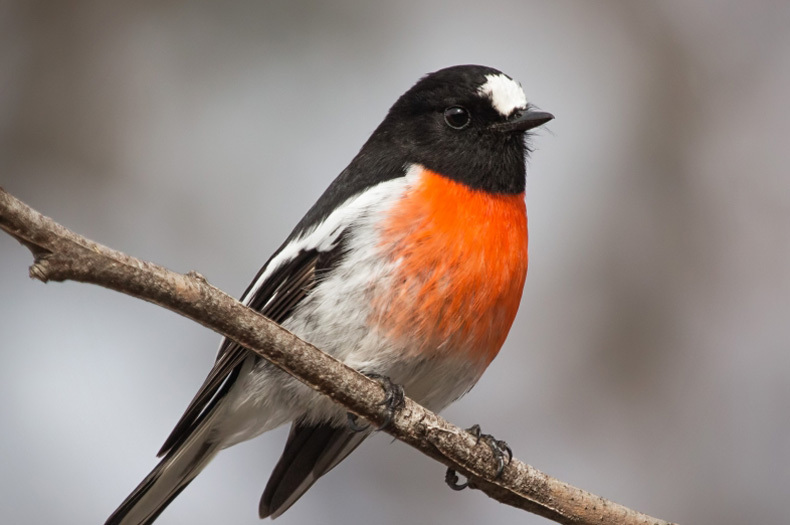 A Scarlet Robin, one of the woodland birds at serious risk from the Monaro dieback. Photo copyright Julie Clark. 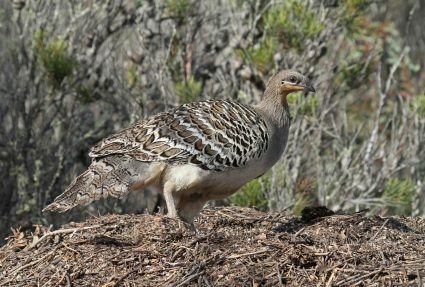 “The Monaro is a stronghold for these woodland birds that are becoming harder and harder to find in areas to the north. It is a last post for many of these species and the disappearance of the Ribbon Gums completely from the landscape would mean the disappearance of these birds too,” says Nicki Taws, Greening Australia Project Manager. “It is difficult coming to terms with the dying-off of a key architectural element of our fragile landscape; a landscape already significantly simplified since European settlement began,” says Charles Massy, local Monaro landholder. To help the ailing trees, provenance research trials are being conducted to investigate whether Ribbon Gums from other locations could provide a more climate resilient option for restoration. 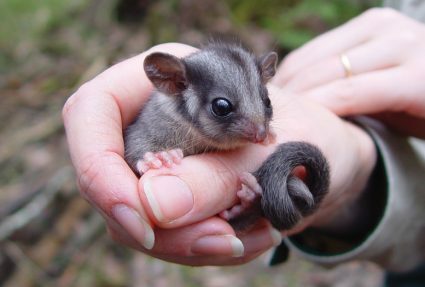 Meanwhile, patches of diverse habitat are being created and relinked on private properties across the Monaro. 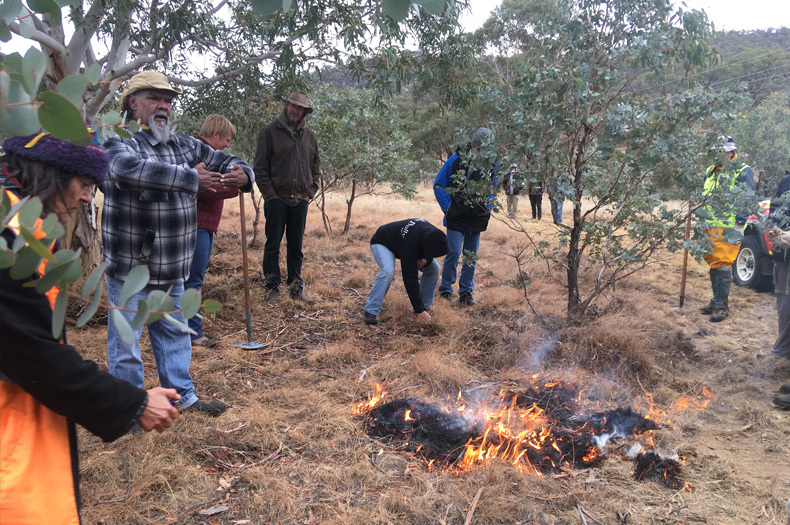 And local Indigenous groups are trialling traditional burns to provide the seedlings with a healthier environment to grow in. “By keeping ground-cover and encouraging natural regrowth of vegetation around the trees, plus planting, we are hopeful we can halt this creeping form of land-cancer and restore our land,” says Charles. Alarmingly, there is no end in sight. The dieback is spreading to the east and south presenting a risk on both fronts. In the south, native Apple Box is starting to succumb, whilst in the east, the dieback is spreading dangerously close to the habitat of a small but genetically important population of koalas. “The dieback has been developing for two to three decades, but it has largely been happening under the radar. 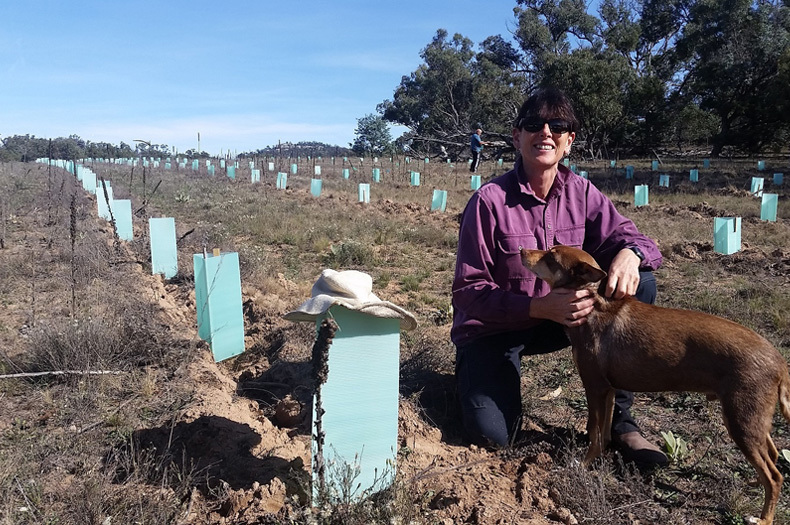 The work that we are doing to try and restore the Monaro is vital for local landholders and the environment, but we really need to scale up our restoration efforts,” says Nicki. 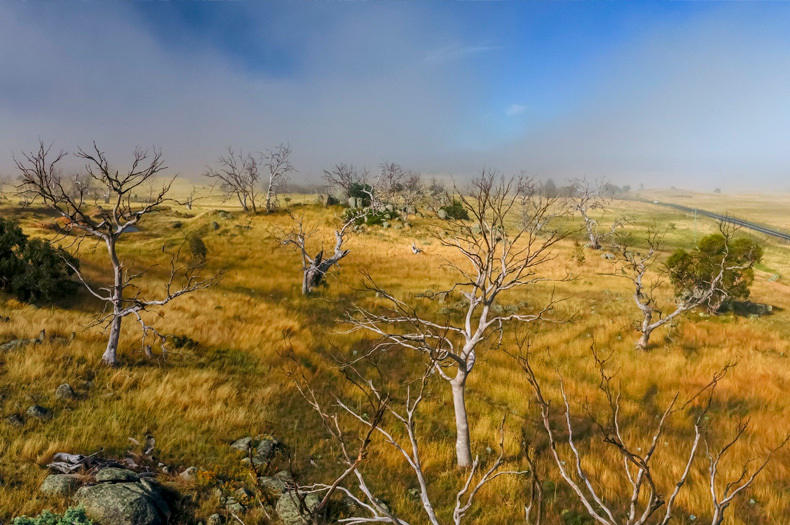 “The Monaro dieback is potentially an indicator of what could be the future for many of our other Australian landscapes under a changing climate. The results of the trials we are doing will be valuable for informing future restoration work,” says Nicki. Aboriginal elder, Rod Mason, conducts a traditional burning presentation. The plight of the Monaro’s once statuesque trees has spurred local artist Sharon Field to design a botanical art collection to highlight the impact of the dieback. An exhibition of her works ‘Monaro Runes’, which will travel overseas, is to be opened by Charles Massy on 1 September in Cooma. “The exhibition is a fantastic way to link an audience that we wouldn’t normally get the chance to engage with, to the issue. Most people don’t want to know about dead trees, but Sharon’s art really brings it to the heart,” says Nicki. The Monaro Comeback program forms part of Greening Australia’s Great Southern Landscapes program. If you would like to provide funding to facilitate more critical research and restoration work in the Monaro, you can donate at www.greeningaustralia.org.au/donate-great-southern-landscapes/. The Monaro Comeback Program is funded through the NSW Government’s Environmental Trust Bush Connect Program. The sculptural forms of the dying Ribbon Gums captured the heart of local artist Sharon Field who is running an exhibition documenting the trees’ struggle. Photo copyright ZRS Photography.